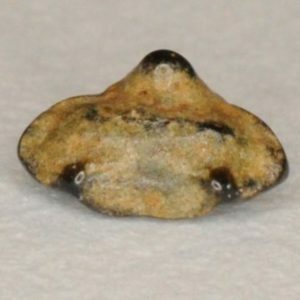 This was an interesting small shark (reaching a maximum body length of 1.5-2 meters) that was likely limited by the paleoenvironment to some unit younger/above the Wenonah formation (when searching the common Monmouth Co. streams); they can also be found in other formations, such as the Englishtown, Woodbury, and Marshalltown (observation of Steve Ballwanz). 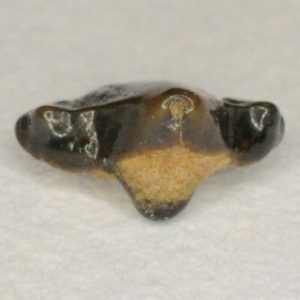 Its lateral teeth (the ones that are picked up more often by collectors) are most similar to that of Cretalamna. The anterior teeth are often confused with Scapanorhynchus, Archaeolamna, Cretalamna, or Sand tigers. The dentition is very heterogeneous and there is a wide range of tooth forms even in the same individual. Their dentition was likely used for tearing. The teeth are generally asymmetrical (the distal root lobe is larger than the mesial one and there are usually more distal than mesial cusplets (although some anterior positions may be more even)), possess a very narrow nutrient groove (unlike Cretalamna which does not have a nutrient groove), may possess small foramina on the root and inside the nutrient groove, have a smooth lingual face, have a V-shaped basal margin (anteriors have a more acute root angle), and are significantly smaller than the median tooth size of common sharks that Serratolamna can be confused with here (excluding Sand tigers, which are usually about the same size). Upper anteriors are slightly distally curved and the lower anteriors may be slightly slanted, but are usually erect. Upper anteriors curve lingually and are thicker than lowers. Lower anteriors are thin and have almost no curvature. Lower anteriors also have a more U-shaped/bent basal margin and more elongated root lobes than the upper anteriors. Nevertheless, it is likely that anteriors are not as common as laterals because the shark possessed less anterior files than lateral files in its dentition. The lateral teeth are much more distinct (especially more asymmetrical) and have well pronounced features. They are more labio-lingually flattened, are wider, and on average have more cusplets (ranging from 1-3, usually more on the distal side) than the anteriors. Upper laterals are more distally curved, are more asymmetrical, and have a straighter basal margin than the lower laterals. 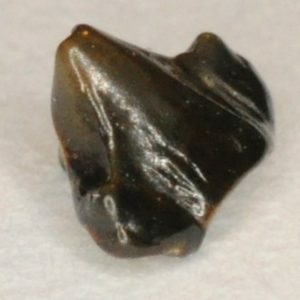 (PICTURES ARE UNDER CONSTRUCTION) This is an upper anterior tooth (1/2 inch). The anteriors are not as distinct in appearance as the laterals. 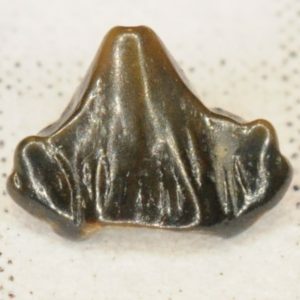 They are sometimes mistaken for other types of shark teeth found here. 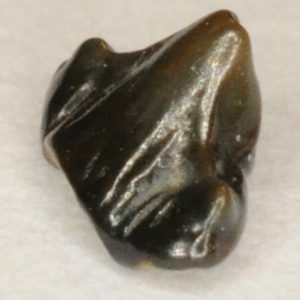 This one was further identified as an upper second anterior by Steve B. (PICTURES ARE UNDER CONSTRUCTION) This is a lower anterior tooth (5/8 inch). These are more gracile and are easy to misidentify.